I’m still reeling from the experience of watching Annihilation in the theater, and I’m about equally pleased with the discussion that came out of this film with my cohosts Will Ashton and Maveryke Hines. 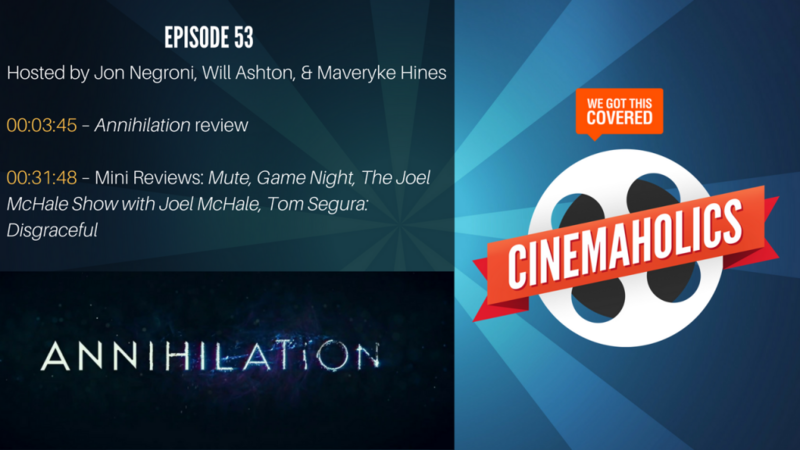 In this episode, we spent a good amount of time unpacking the good, bad, and stellar Annihilation has to offer, and I suspect we’ll be revisiting this conversation throughout the rest of the year. But that wasn’t the only movie we had some fun with this week. After a half-hearted review of the new Netflix movie, Mute, we got to an extended Mini Review of Game Night, a new studio comedy I find myself effortlessly recommending. And the box office agrees too, which put Game Night at #2 for the weekend behind Black Panther, which is continuing its gargantuan run across the world. During Mini Reviews, we also had a brief discussion about Netflix original films. Between Bright, Cloverfield Paradox, and Mute, it seems Netflix is having a rough time pleasing critics despite their success with original shows. So that leads to our question for you all. Which Netflix original film is your favorite?